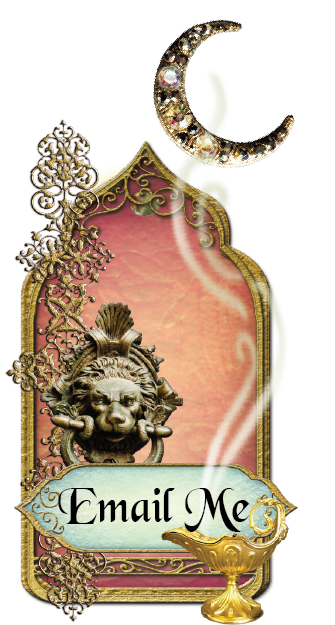 Do you need to blow off some steam with your BFFs? 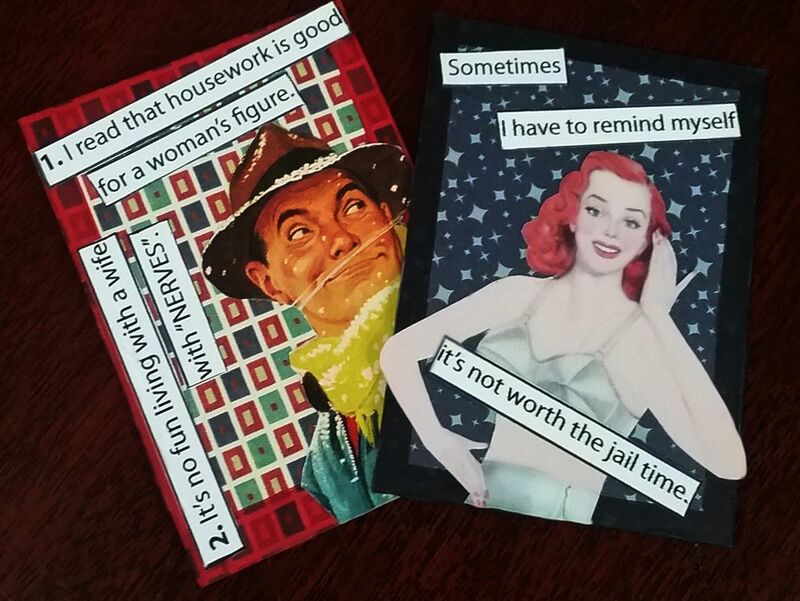 Is your significant other driving you crazy? 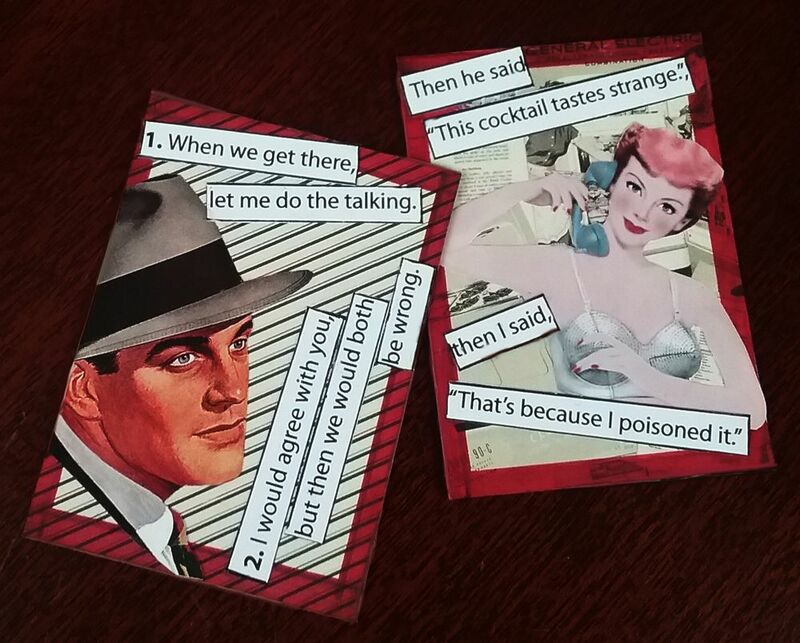 Are you ready for a night of cocktails and catty fun? 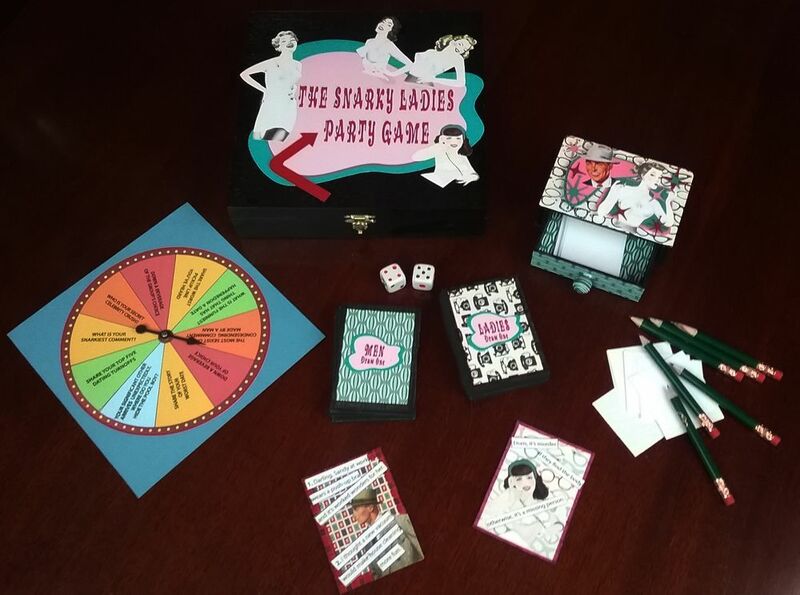 Then you’ll love the Snarky Ladies Party Game. 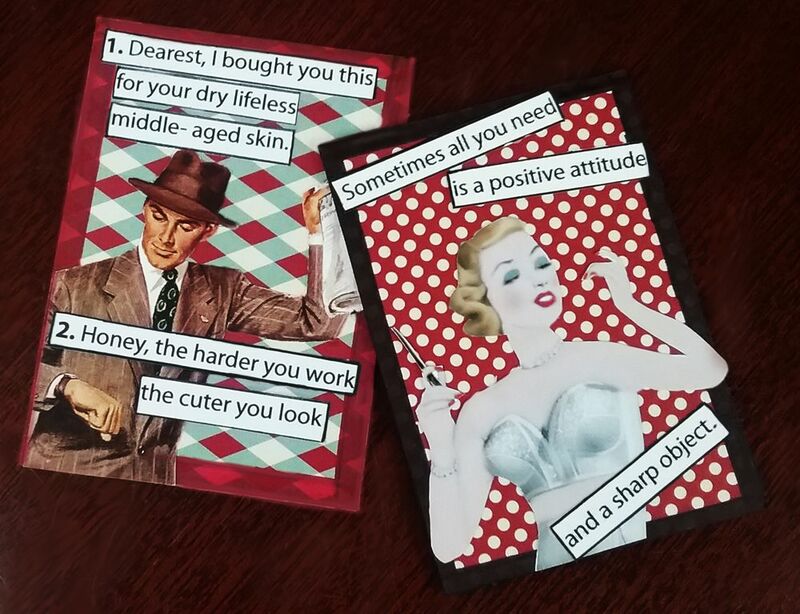 Behind the perfectly styled hair, flawless makeup, arched backs, and bras that look like they could shoot bullets (think of Austin Power’s Fembots), is a snarky lady who knows just what to say. 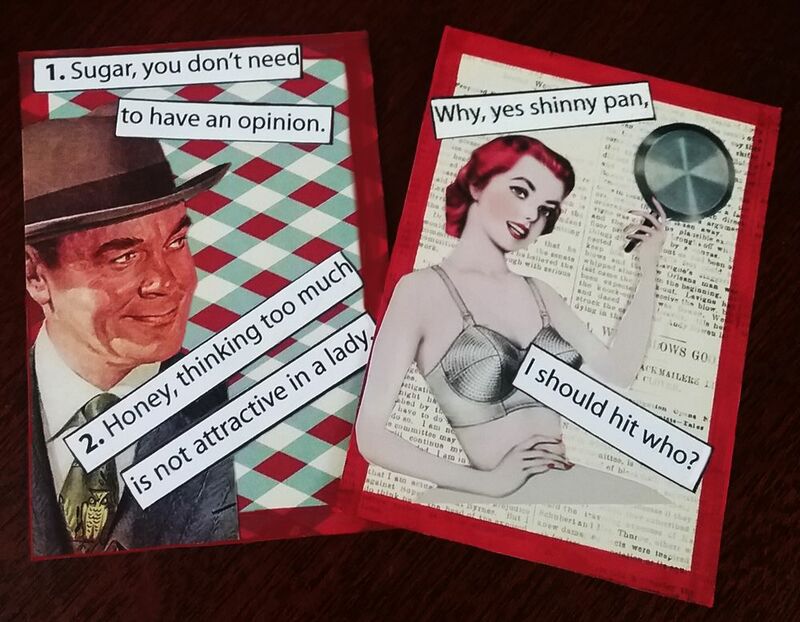 The theme for this project is inspired by vintage product advertisements which are truly cringe-worthy, particularly the ones directed at women. Many can be boiled down to; if you don’t buy our product whether it be appliances, food, clothing, makeup or feminine products your life will not be worth living, no man will want you, if you have a man, you won’t be able to keep him. 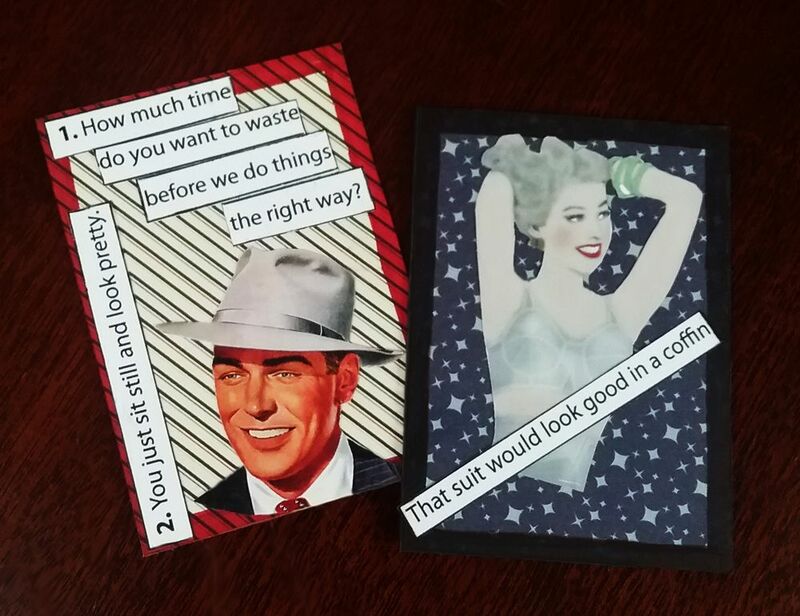 For this project, I've created a NEW "Intimates" collage sheet of vintage women from ridiculous bra advertisements. 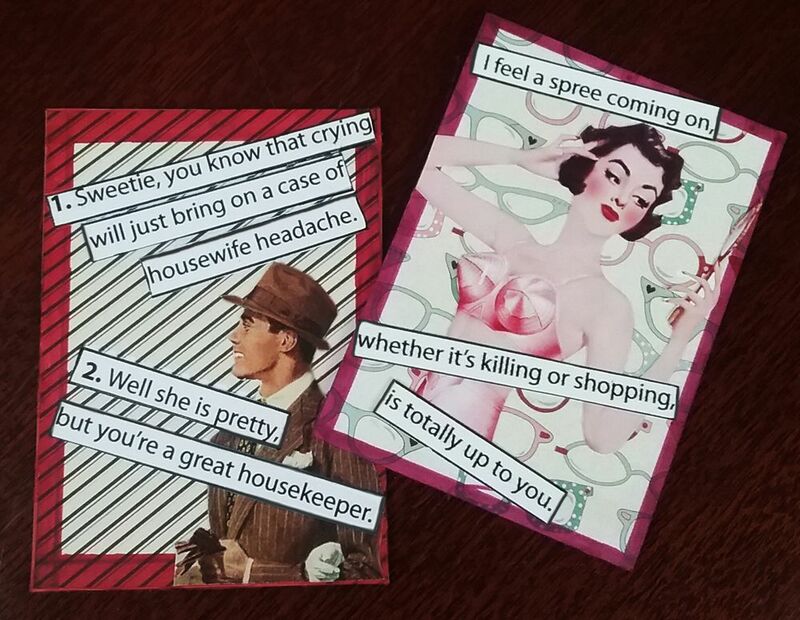 I started by working on some ATC snarky lady cards and wasn’t satisfied, thinking there must be something more I could do with the cards and the theme. 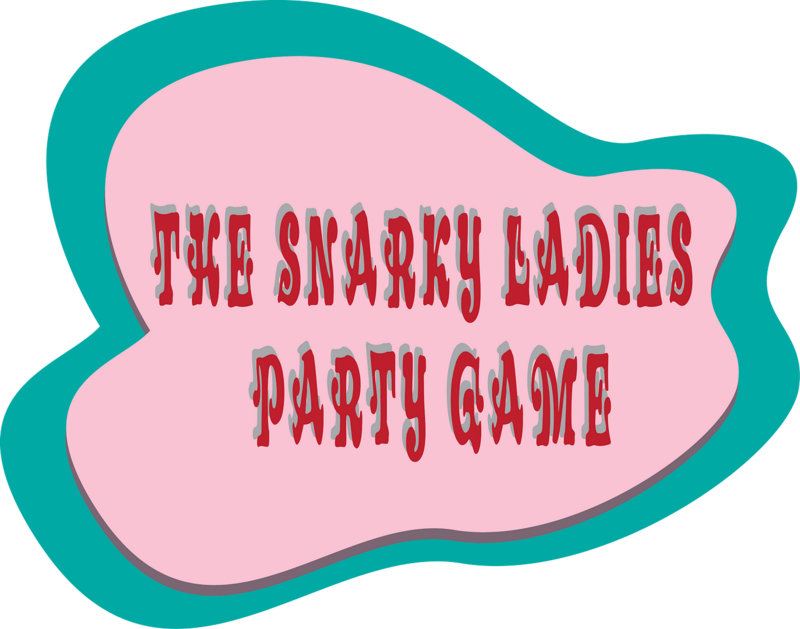 After discussing it with my husband, he suggested making it into a game and “The Snarky Ladies Party Game” was born. 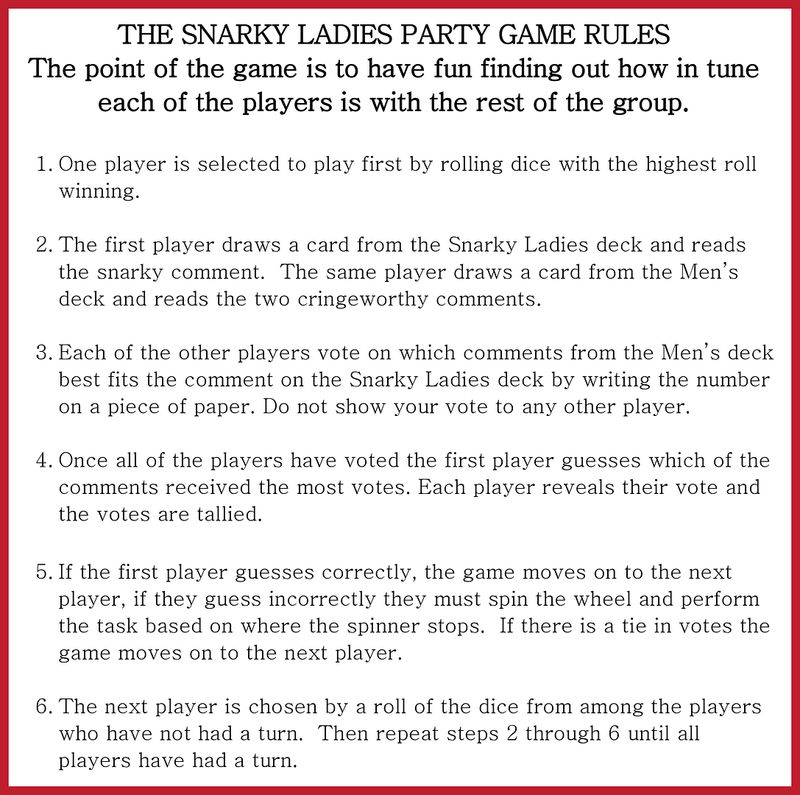 The object of the game is to have fun finding out how in tune each of the players is with the rest of the group. 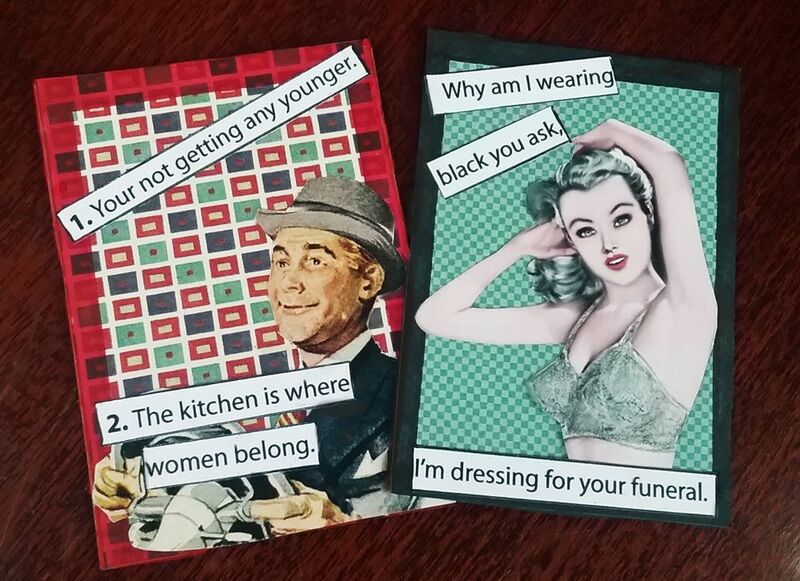 There two decks of cards (Men & Ladies). 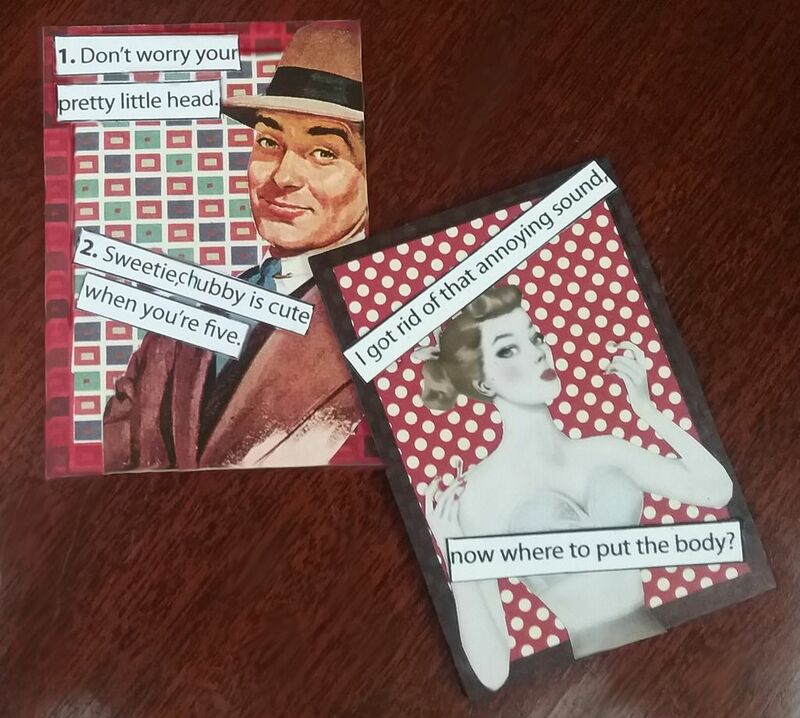 The men cards have two cringe-worthy comments and the Ladies cards have a snarky response. All but one of the player's votes on which of the cringe-worthy comments best fits the snarky comment. 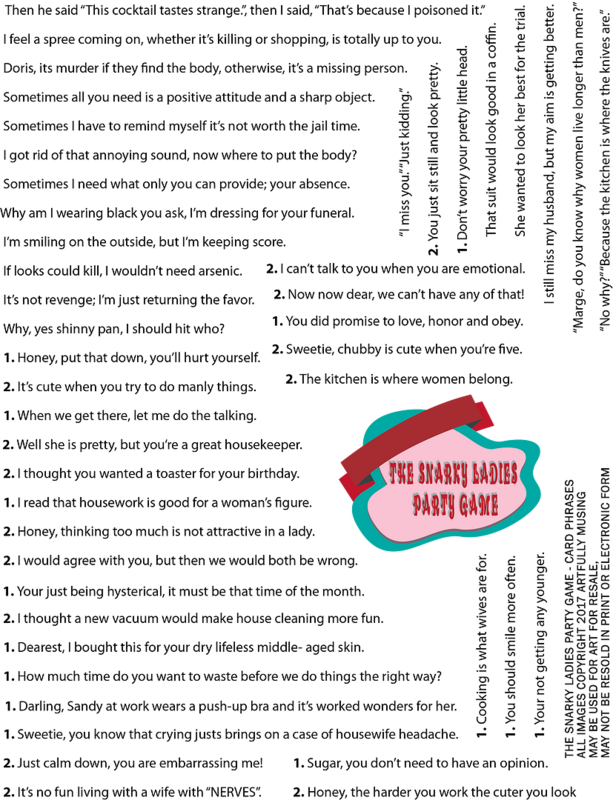 The remaining player must guess which of the men comments was chosen by the majority of the players. 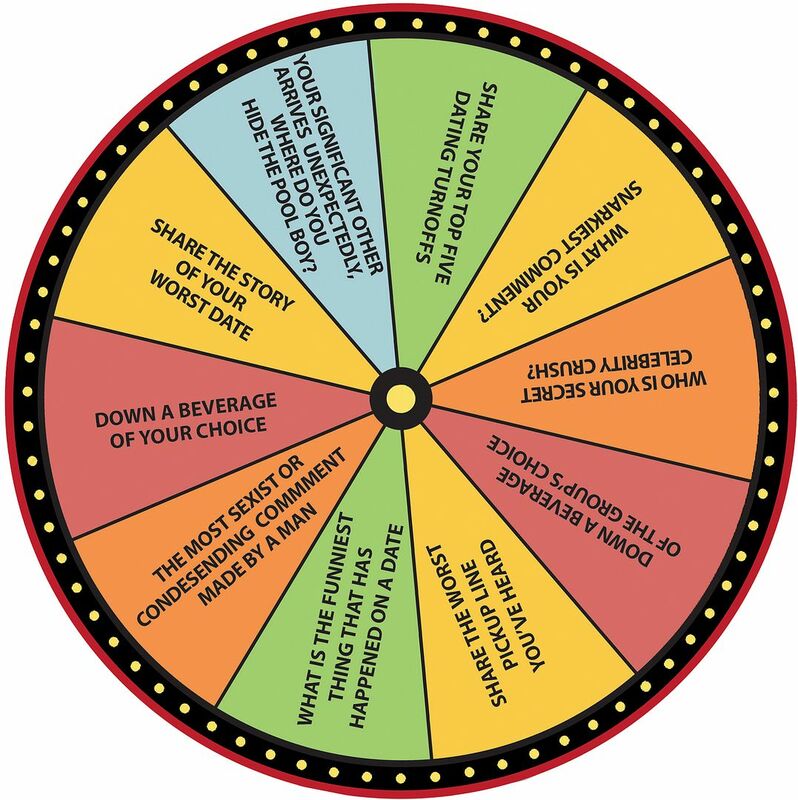 Failure to make a correct choice means a spin of the wheel and answering a question or fulfilling a task. * Your significant other comes home unexpectedly, where do you hide the pool boy? * What’s the worst pickup line you’ve heard? Play continues until all of the cards and players are exhausted. At the bottom of the post, you'll find the game instructions that you can print and use for your game. 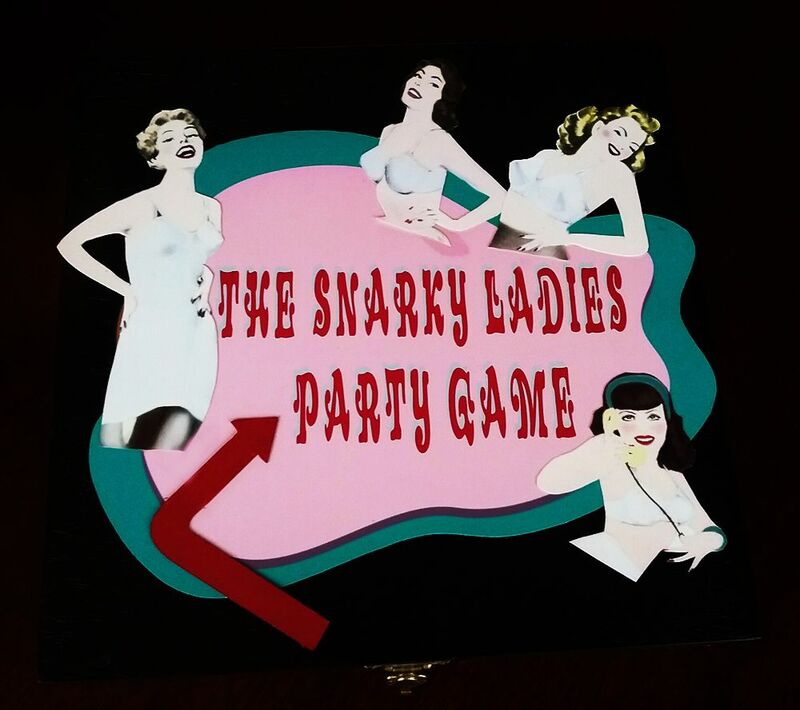 I used a cigar box to store the game and attached the large “Snarky Ladies Party Game” label to the front. 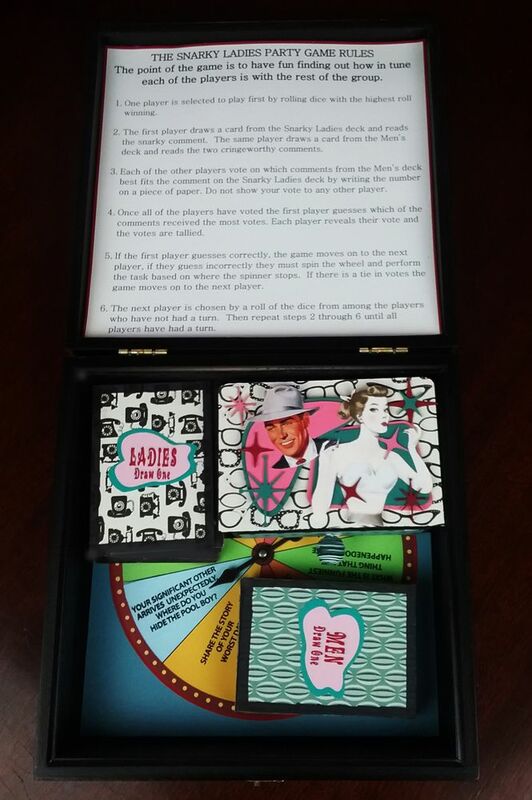 On the inside lid, I attached the game rules. 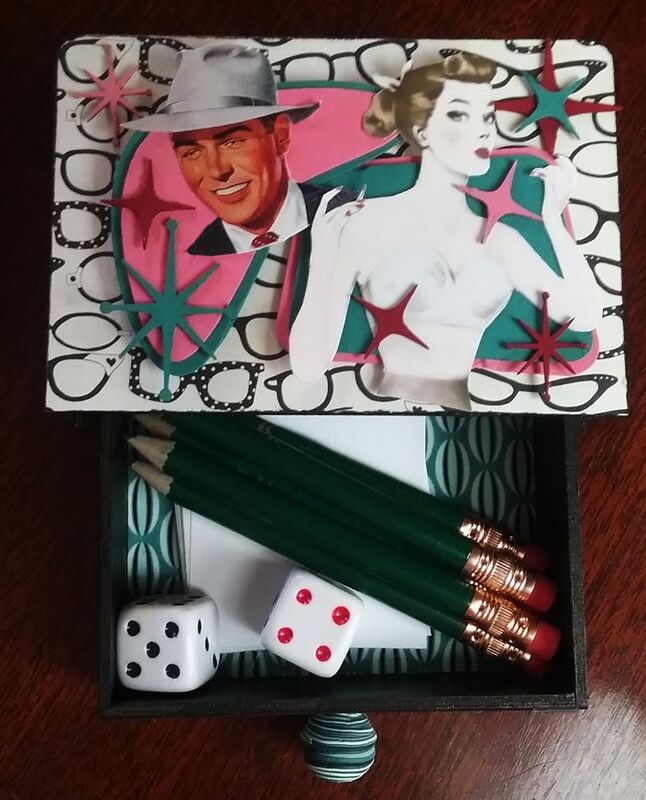 In the box is the game wheel, two decks of cards (Men & Ladies) and a box with a drawer which contains slips of paper for voting, pencils and a pair of dice. 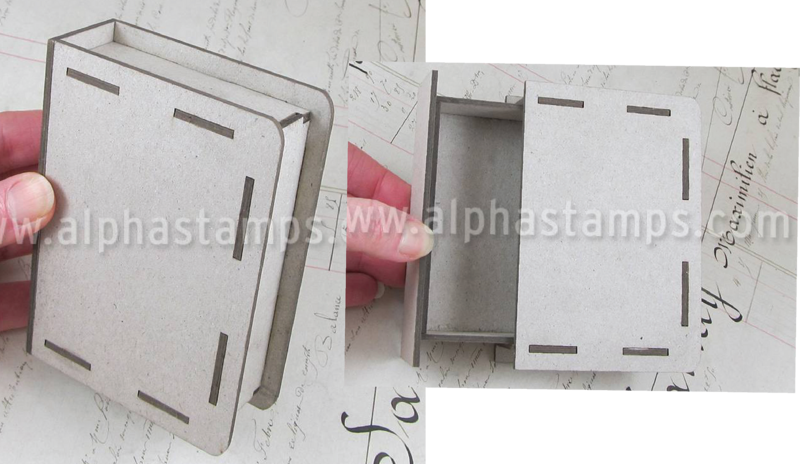 The box is made from an ATC sized Hidden Drawer Book Box chipboard kit. 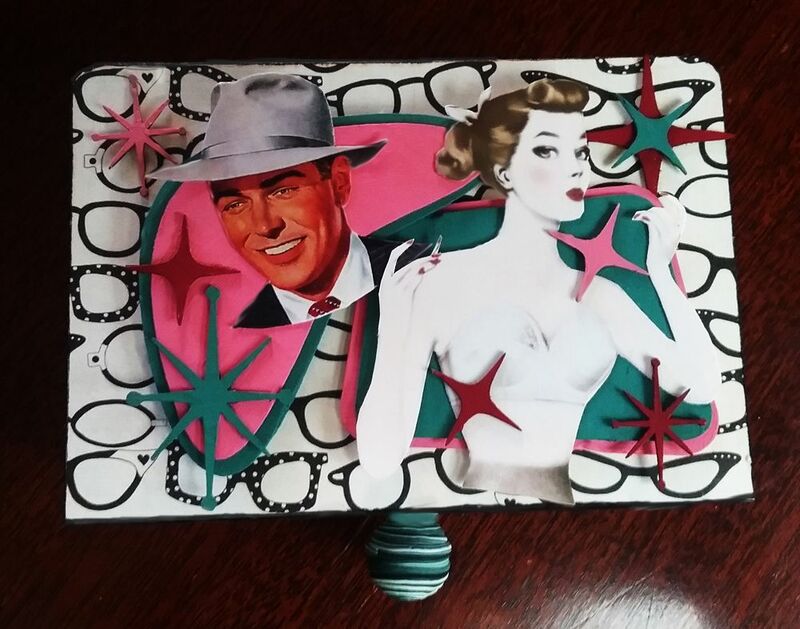 I’ve decorated the top with chipboard retro shapes, and images from the collage sheets. 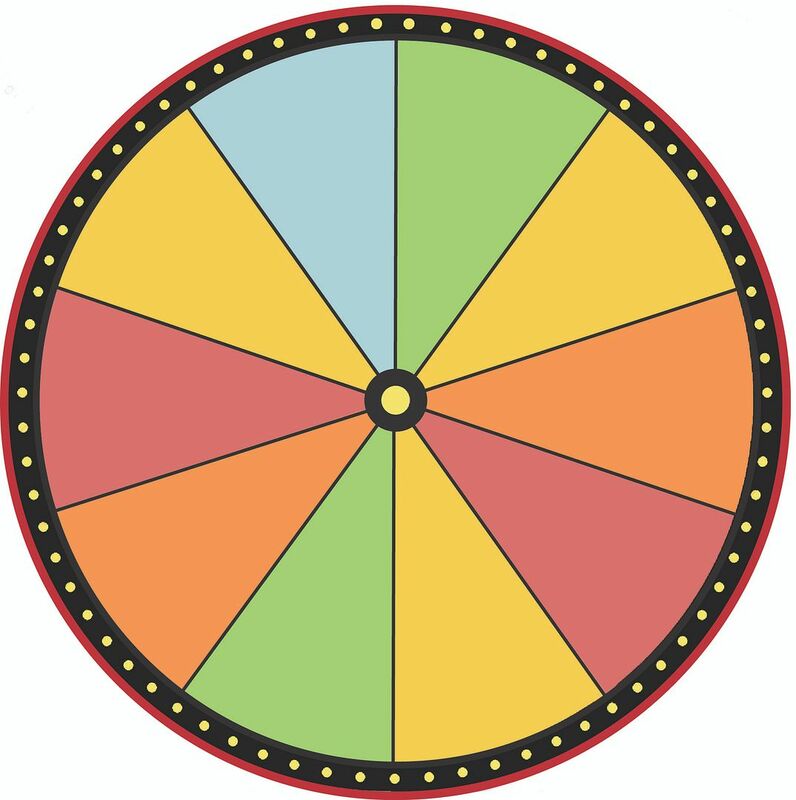 TIP: When adding a spinner to the wheel, use something like a rondelle in between the wheel and the spinner so that the spinner floats above the wheel. This will make it easier to spin. Attach the spinner & rondelle combination to the wheel with a brad. 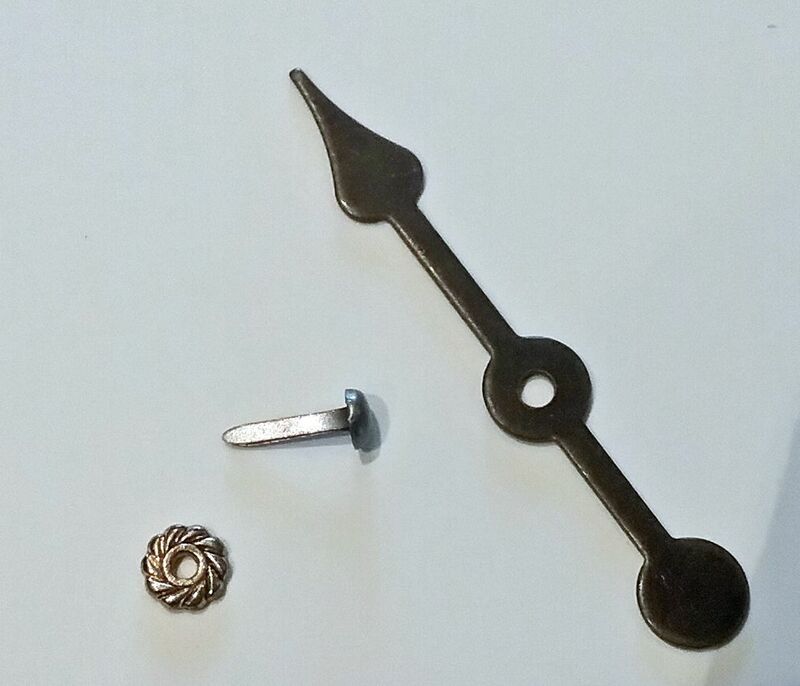 When opening the brad to secure it in place, make sure it is loose or you won’t be able to spin the spinner. 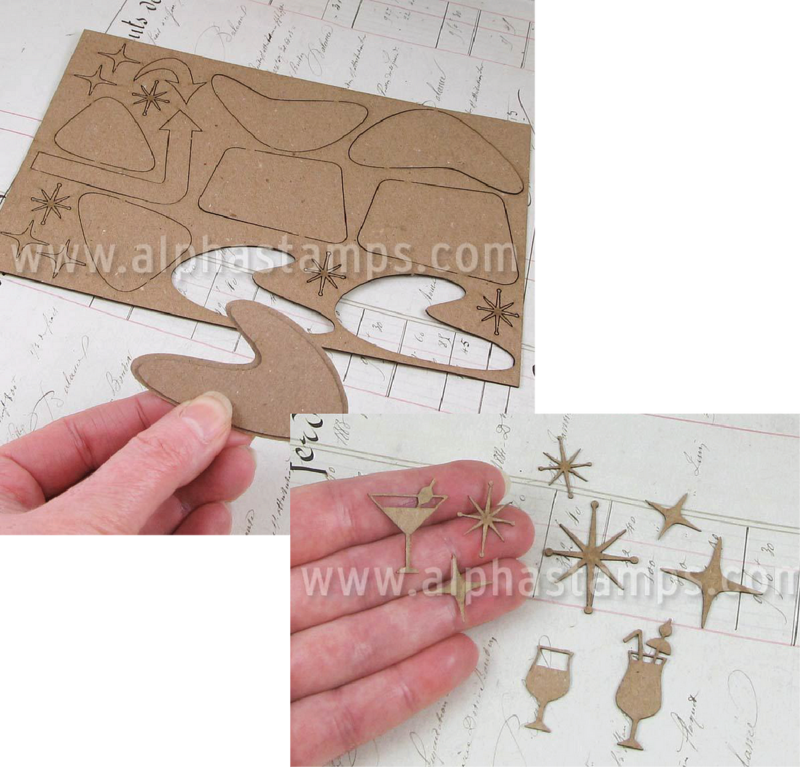 When making the game cards for stiffness I used chipboard ATCs in between the decorative paper. 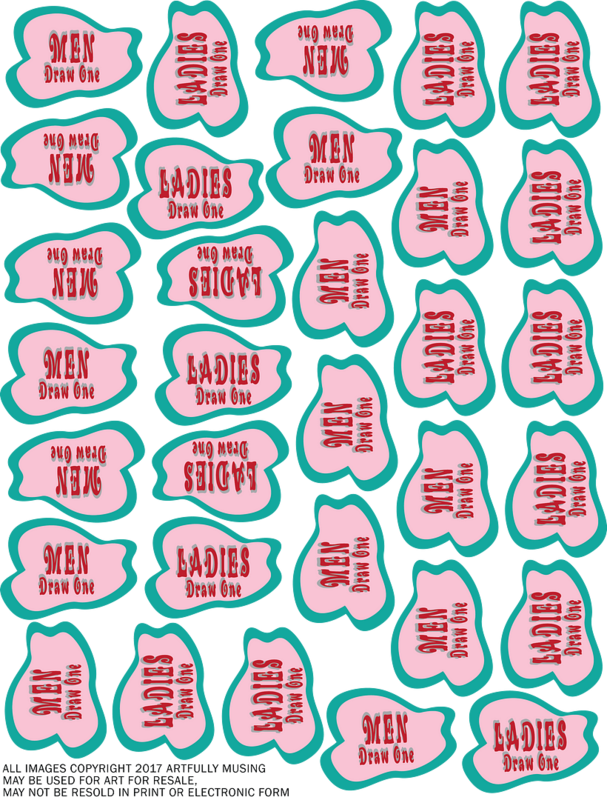 This sheet includes 13 lovely vintage ladies in bras. This sheet contains lots of quotes to get you started. 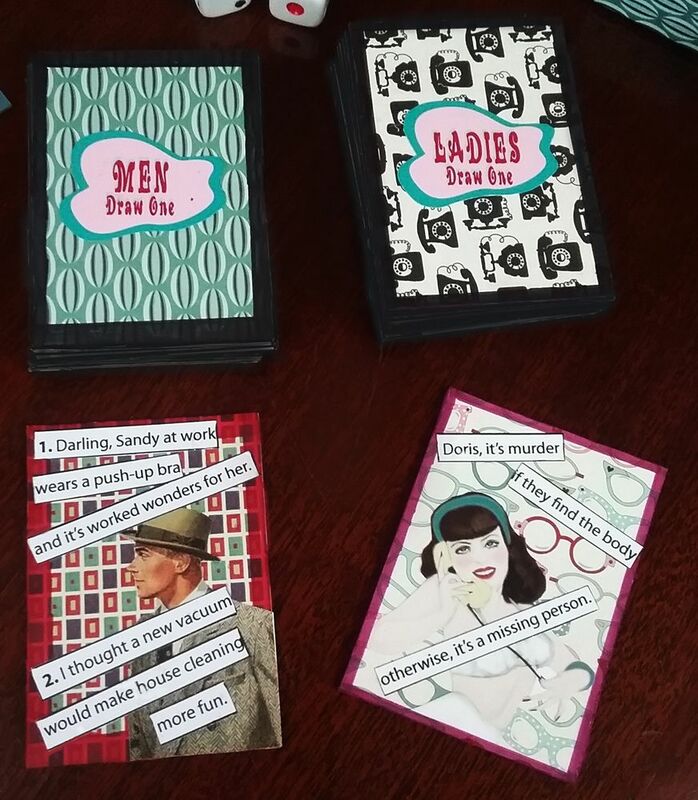 The number of cards you create is up to you. 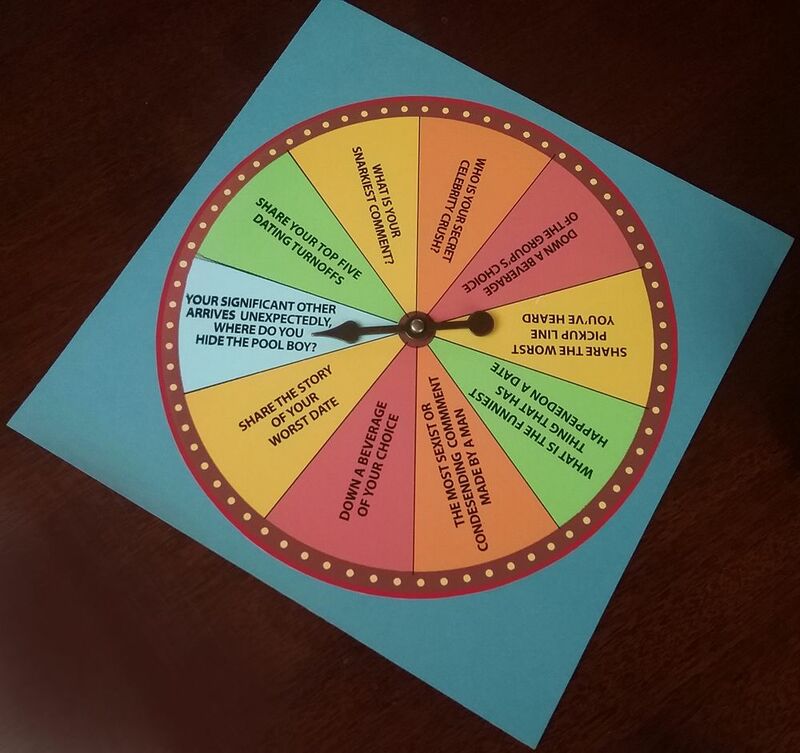 I've included the wheel I used and a blank wheel that you can customize.